Option two, which is your best and cheapest option is to hire a reputable bail bond company. All bail bond companies are regulated by the Department of Insurance. The fee you have to pay in accordance with NV Law is 15% of the bail amount. In the above DUI example that would be 15% of $3000, which is $450. This means that all bail companies have to charge the same as a matter of law. Since price is not an issue you will want to consider the following in hiring a bail bond company. Make sure they are licensed and insured and especially accredited by the BBB. You should also select a company that is willing to work with you on a payment plan of the 15% and also someone you feel comfortable with. You may want to take in account that most companies have bail stipulations where they will inconvenience the defendant through mandatory check-ins and the possibility of re-arrest if a check in or even court date is missed in error. That is why the bail company should be BBB accredited. Almost all bail companies in Las Vegas are NOT accredited by the BBB. Your third and last option is to stay in jail until you will see the judge which is usually within 72 hours. There is a small chance that the judge may release you but most of the time there is an adjustment in the bail amount which could be higher. It is to your best interest to get a bail bond as soon as possible and get out of jail. eBAIL is a professional, licensed, bonded, insured and BBB accredited bail bond company servicing the greater Las Vegas area including North Las Vegas, Henderson and nationwide. We do not require mandatory check-ins and do not re-arrest defendants that missed a court date in error. 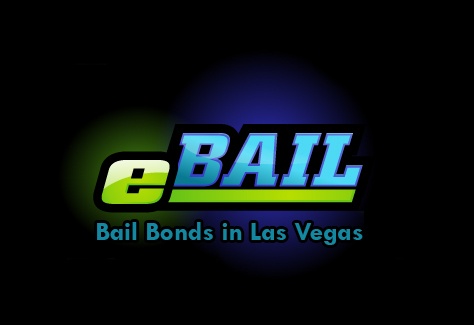 eBAIL offers Online Bail Bonds in Las Vegas in 3 minutes or less. Visit us at our beautiful office at 3100 E. Charleston Suite 108 or for immediate attention call 24 hours a day 702-462-9200. You will be glad you choose eBAIL as your bail bond company, guaranteed! BAIL BOND RELEASE – Almost all arrestees are almost immediately eligible to be released on a bail bond. This option is the fastest and cheapest release option from any jail. Within a few hours after being arrested the jail will determine a bail amount. A reputable Las Vegas Bail bonds company will pay this bail amount through a bond which is like a check. For example, if the bail for a DUI is $3000 then the bonding company will write a check for $3000 and give it to the jail for the inmate’s release. The jail will hold on to the check until all court dates are attended and then given back to the bail bonds company. For this risk the bail bonds company is required to charge 15% of the bail amount, which is $450 in the above example. The 15% is required by Nevada State Law NRS 697.300 and cannot be more or less. A Bail Bond is the fastest, cheapest and most convenient option to get someone released from jail. Previous post: Aladdin for Bail Bonds?